Inside the worlds first Digital SLR camera with rear LCD and inbuilt JPEG processing, the 1998 vintage Kodak DCS315, based on the Nikon Pronea 6i film SLR camera body. It seems you have a pretty difficult time reading the chip numbers through the camcorder LCD eh? Don't blame you -- I know how difficult it is! I'm amazed you can solder while looking at the LCD. You've got almost no depth perception when you do something like that through a camera! Yes, it's not easy even though it's a 900K+ pixel 3" LCD. I sometimes have to look over the top of the camera while talking. I miss a lot of stuff that is obvious to people watching the video in HD. Those screwed-down flat-flex connections are the most bizarre thing I've seen in a while. Can you imagine sitting down and figuring out that you needed to do that? Yes. At what point in the design process do you go from thinking that a few complete right angle flex cables would do the job, to some convoluted multi level contact scheme with clamps? maybe hang 32' TV on the wall in front of you and connect it to the camera, would that make your life easier? Any plans to try and get the camera to work or find out what's wrong with it? I you remove that alen screw it will fall apart in halves? I assumed that the contact mechanism was the connector to the back panel of the original camera. Even then they are still strange connectors. Maybe some of them are motor connectors? Rotation/position sensors? Weird, that is for sure. The LCD window lower down is the standard LCD on the film camera. Love to see a teardown of the film camera. That is one insane franken camera. Wonder how many they sold? Probably from original Nikon Pronea 600i, look a bit like for rotary dials/switches on the back of camera or sensors. I am curious to see what kind of lighting they use for the LCD. I have a Casio QV-770 camera, really old, 640x480 max resolution, 4MB storage, no card slots, serial port used for download via a 1/8 audio style jack. They use a custom fluorescent tube , it is white and square the size of the LCD and about 3mm thick with a small glass pipe on the side for the electrode wires, never seen anything like it. I plan to post photos of the tear down when I get time. wow the casio is 15 years old, must have been one of the first. For that I would guess a panaplex tube, it was a flat panel discharge lamp with a discharge confined to a channel by dimples in the glass backing, and front phosphored. Originally developed as a flat lighting panel to replace a standard cieling tile with a diffuse light source, but never was popular due to the high cost of making them. A small rectangular one though would be a good light source ( in the days before they got a good way to make a diffuser that would provide even illumination from a line source at the one edge) for such a display. 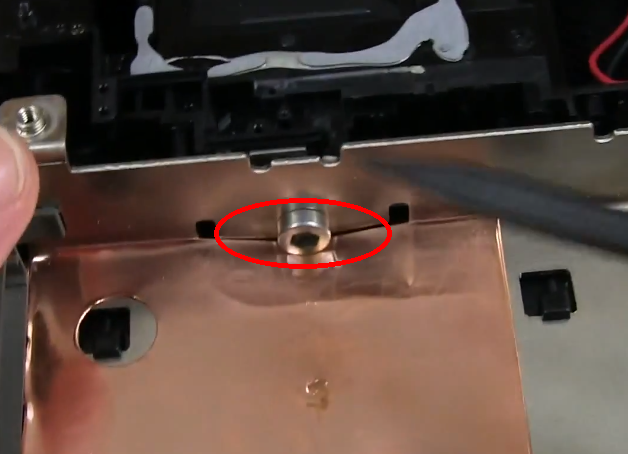 That PCMCIA socket is easy to remove, no soldering required. It's a socket in a socket, very common on notebook computers. I was dying for him to unscrew that, it appears to be the original host camera tripod mount screw.